Don’t get me wrong. I personally like some of the players in the bureaucratic mess we know as state government. Elsenheimer in this story for example, is a relatively right of center guy. Yet he has to feed the family, and the overly high taxes on his estate in GT County have to be paid. It would be an extraordinary act of courage to sit as executive director of a redistribution agency and wind it out of existence. Even declining such an appointment might actually lead to worse people occupying the position and if market forces work, perhaps even be paid more. How we can eliminate this type of government interference and theft, and return the high wage lackeys of ‘social justice’ back to honest wealth creation is the hard part. In the meanwhile, ‘givers’ gotta give, and making the inexcusable seem oh-so-reasonable is just part of the job. 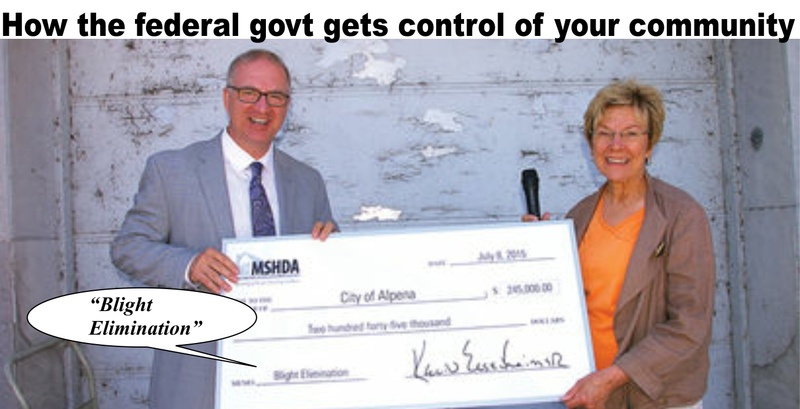 As an example of how words matter, one might look only as far as the most recent press releases propaganda from MSHDA. SAULT STE. MARIE, MICH. – Two Chippewa County homebuyers welfare recipients will receive help to purchase and rehabilitate their new homes through a MSHDA Community Block Development Grant awarded to the Chippewa-Luce-Mackinac Community Action Agency Human Resource Authority, Inc. The granttaxpayer giveaway totaling $155,000 will be used to provide down payment assistance and rehabilitate two homes as well ascover to fund a CLMCAA acquisition/development/resale (ADR)slush project within the city limit of Sault Ste. Marie. The ADR project involves the purchase and rehabilitationredistribution of real estate by CLMCAA and the eventual sale of the completed developmentpayoff to crony pals masquerading as a gift project to an income-eligible owner-occupant. CLMCAA’s purpose is to mobilize and utilize resources in an attack on poverty self reliance and independence; to provide decent affordablesubpar housing and unreasonable lifetime expectations for persons of low and moderate income; to provide services, assistance and other activities of sufficient size and scope to give promise to program to elimination of poverty unrealistic expectations to those on welfare that they too can afford a home, its upkeep and other responsibilities associated with it, or its cause. MSHDA administers the federally-funded CDBG program through its Office of Community Development. CDBG funds are used by to rope in smaller communities and counties ostensibly to upgrade homes owned by lower income residents and carry out other housing activities. Money also is used to fund neighborhood preservationand community enslavement programs. down-payment assistance programs as well as rental development and rehabilitation activities. Actually Jason, the CRA has got nothing on what is actually happening here. What we're looking at the tip of a huge iceberg coming our way that no one has been paying very much attention to lately. Let me introduce everyone to the Inclusive Communities Project. This is one of those very recent SCOTUS rulings in which the Justices were more concerned about their legacy and how history will view them long after they are gone, rather than being remembered for citing any real law to justify their decisions while they are still alive. In the case of Texas Department of Housing and Community Affairs v. The Inclusive Communities Project, Inc. that was decided in a 5-4 vote in June, SCOTUS made up new powers and authority took issue with the fact there were not enough "poor" people living in well-to-do neighborhoods, and that it was incumbent for the government to step in and do something, albeit not coming directly out there are imposing quotas (think forced school busing debacle from the 1970's). "It permits plaintiffs to counteract unconscious prejudices and disguised animus (emphasis mine) that escape easy classification as disparate treatment. In this way disparate-impact liability may prevent segregated housing patterns that might otherwise result from covert and illicit stereotyping." So in attempting to shoe-horn in the FHA to support the desired outcome (the FHA being yet another made up power of the federal government), Justice Kennedy is claiming the real reason that you don't see very many poor people living in, say, Bloomfield Hills or Grosse Pointe is because the people already living there are depriving poor people from "Movin' on up..." is due to unconscious racism! How he got this this conclusion is still a little fuzzy. Just don't to be too surprised in the near futire when you see you local elected official handing out more "free money" under the because a SCOTUS judge wanted people to remember him fondly (even though, I'll wager that most people couldn't identify Kennedy even if they were standing right next to him). Thanks for the add-on there KG!